U. researchers explore 21st century uses for coal as utilities turn to greener energy sources. Francisco Kjolseth | The Salt Lake Tribune Eric Eddings, Professor of Chemical Engineering at the University of Utah, speaks at a Industrial Combustion and Gasification Research Facility in West Salt Lake where carbon-friendly methods of turning coal-derived pitch into carbon-fiber composite material are studied. Engineers from the University of Utah are launching a $1.6 million project to research cost-effective ways to help revitalize coal communities threatened by a decline in production. Francisco Kjolseth | The Salt Lake Tribune Cynthia Furse, Associate Vice President for Research and Professor of Electrical and Computer Engineering at the University of Utah, holds a chunk of coal and a carbon-fiber prosthetic leg to illustrate the carbon-friendly methods of turning coal-derived pitch into carbon-fiber composite material. Engineers from the University of Utah are launching a $1.6 million project to research cost-effective ways to help revitalize coal communities threatened by a decline in production and turning coal into carbon-fiber with less impact on the environment is being championed as a viable solution. 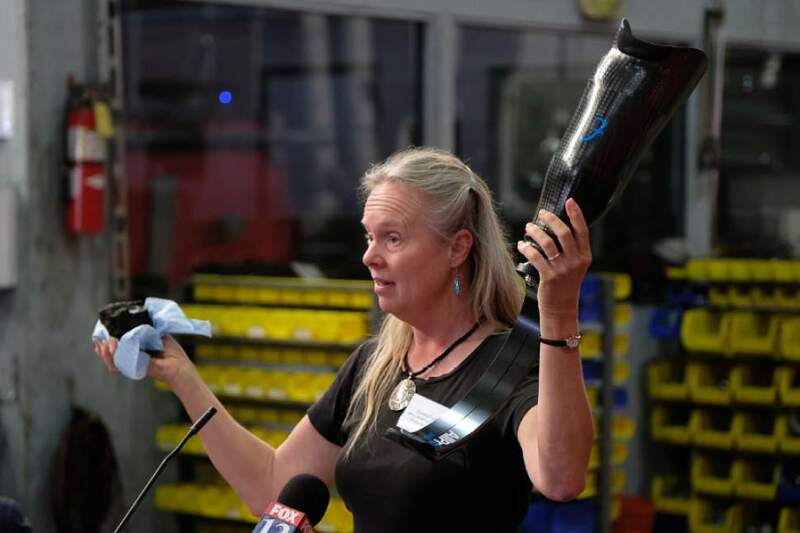 Francisco Kjolseth | The Salt Lake Tribune Cynthia Furse, Associate Vice President for Research and Professor of Electrical and Computer Engineering at the University of Utah, holds a chunk of coal and a carbon-fiber prosthetic leg to illustrate the carbon-friendly methods of turning coal-derived pitch into carbon-fiber composite material. Engineers from the University of Utah are launching a $1.6 million project to research cost-effective ways to help revitalize coal communities threatened by a decline in production and turning coal into carbon-fiber with less impact on the environment is being championed as a viable solution. 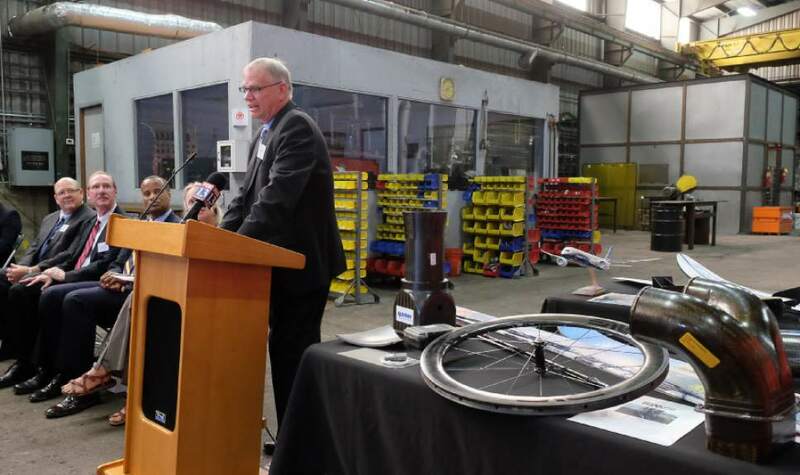 Francisco Kjolseth | The Salt Lake Tribune Rep. Brad King, D-Price, says a few words at the Industrial Combustion and Gasification Research Facility in West Salt Lake. Engineers from the University of Utah, launch a $1.6 million project to research cost-effective, carbon-friendly methods of turning coal-derived pitch into carbon-fiber composite material, as well as analyze its market potential and whether it can help revitalize coal communities threatened by a decline in production. This more carbon-safe process could produce composite materials for a slew of products including airplane and automobile parts and outdoor recreational equipment. Francisco Kjolseth | The Salt Lake Tribune Eric Eddings, left, professor of chemical engineering at the University of Utah, holds a piece of coal as he stands for a portrait with Jay Williams, U.S. Assistant Secretary of Commerce for Economic Development as he holds some of the items that are made by carbon-friendly methods of turning coal-derived pitch into carbon-fiber composite material. Engineers from the University of Utah are launching a $1.6 million project to research cost-effective ways to help revitalize coal communities threatened by a decline in production. Francisco Kjolseth | The Salt Lake Tribune Engineers from the University of Utah launch a $1.6 million project to research cost-effective, carbon-friendly methods of turning coal-derived pitch into carbon-fiber composite material, as well as analyze its market potential and whether it can help revitalize coal communities threatened by a decline in production. 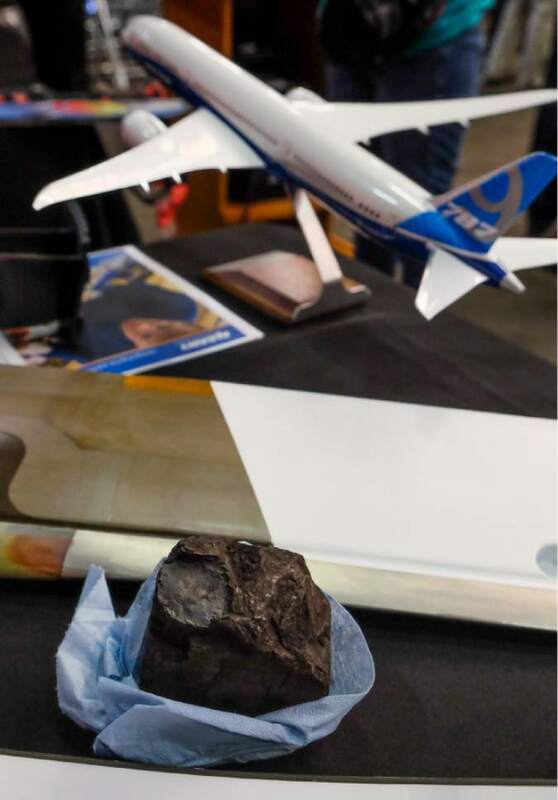 A chunk of coal sits amongst some of the items that are manufactured with carbon-fiber that originates from coal-derived pitch. Francisco Kjolseth | The Salt Lake Tribune Eric Eddings, left, professor of chemical engineering at the University of Utah, speaks with Jay Williams, U.S. Assistant Secretary of Commerce for Economic Development as they overlook some of the items that are made by carbon-friendly methods of turning coal-derived pitch into carbon-fiber composite material. Engineers from the University of Utah are launching a $1.6 million project to research cost-effective ways to help revitalize coal communities threatened by a decline in production. Many see coal as an energy source of the past, one that has outlived its usefulness, but scientists wonder whether the carbon-rich rock, blamed for many environmental ills, could be tapped for composite materials of the future. Now the University of Utah is looking for ways to turn the state rock into carbon fiber, a high-tech material that is light and strong and may be capable of building a 21st century manufacturing economy in environmentally benign ways. "There&apos;s an abundance of coal, and we would like to find an alternative use for it. It is a huge natural resource in the U.S., and we have a whole coal-mining community that is desperate for a new direction," U. chemical engineering professor Eric Eddings said Wednesday. "If we can find an economical way to use coal to produce carbon fibers and have enough useful products so there can be a market for it, then they have that new direction. And it&apos;s more carbon friendly than just burning coal in a power plant." 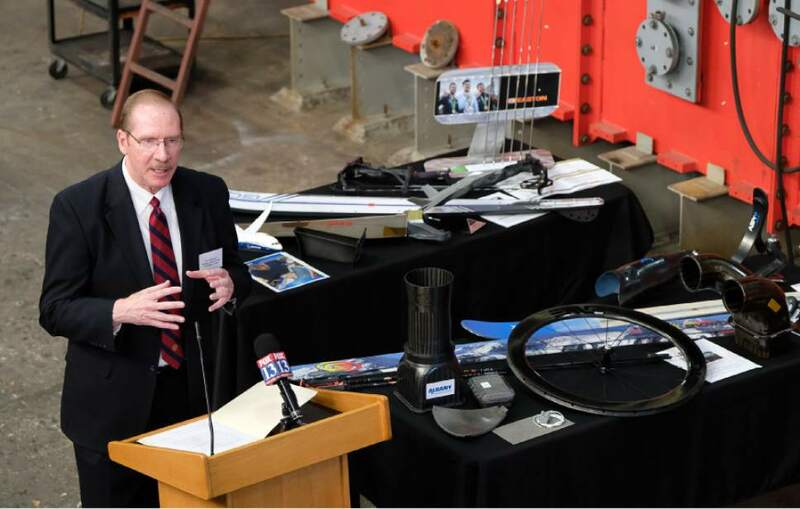 Surrounding himself with products made with carbon fiber, Eddings announced a three-year, $1.6 million research project during a gathering for media at an experimental combustion facility the U. operates in Salt Lake City&apos;s industrial western end. Half the funding is scheduled to come from a federal program aimed at repurposing coal and retraining workers displaced by coal&apos;s decline. President Barack Obama&apos;s administration dispatched a senior official to Salt Lake City to announce the distribution of $7.7 million in grants from the U.S. Economic Development Administration in support of 14 research projects. 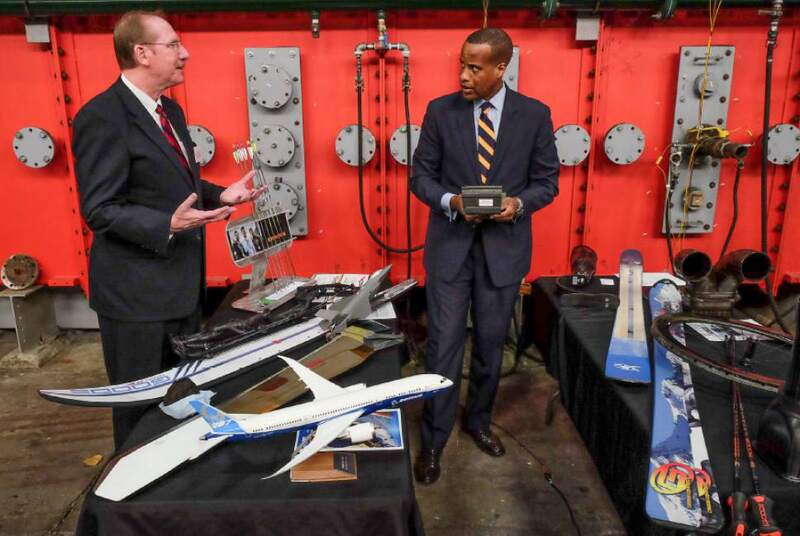 "It is the administration&apos;s commitment to help those communities that have relied on fossil fuels to transition and be more economically diverse as our country&apos;s energy profile has changed," said Jay Williams, assistant secretary of commerce for economic development. "There has to be assistance and investment from the federal government. The goal is to stimulate that growth, provide catalytic investments that attract private-sector capital. This project will address regional and national retractions in the coal industry by examining commercially viable uses for coal byproducts. This is an important project that will help the state respond to the closure of the Deer Creek Mine and idled West Ridge Mine in Carbon County, which has resulted in the loss of more than 400 jobs." Demand for U.S. coal has declined steeply in recent years as utilities turn to energy sources that don&apos;t emit as much carbon dioxide, a greenhouse gas blamed for climate change. Utah coal production dropped to 17 million tons in 2014, spurring a controversial plan led by Carbon County to invest in an export terminal in Oakland, Calif. in hopes of moving Utah coal to Asian markets. Oakland city leaders shut down the plan, but Carbon County Commissioner Jae Potter and Rep. Brad King, D-Price, are optimistic for an industry that was integral to their community for a century. "I often tell my constituents, &apos;Put on your smiley face. Coal is not going away, coal is not dead,&apos; " Potter said at Wednesday&apos;s gathering. "We may be suffering a little bit right now, but there are many projects that can help. I am hopeful this is one of those first steps to allow this to happen in our community." 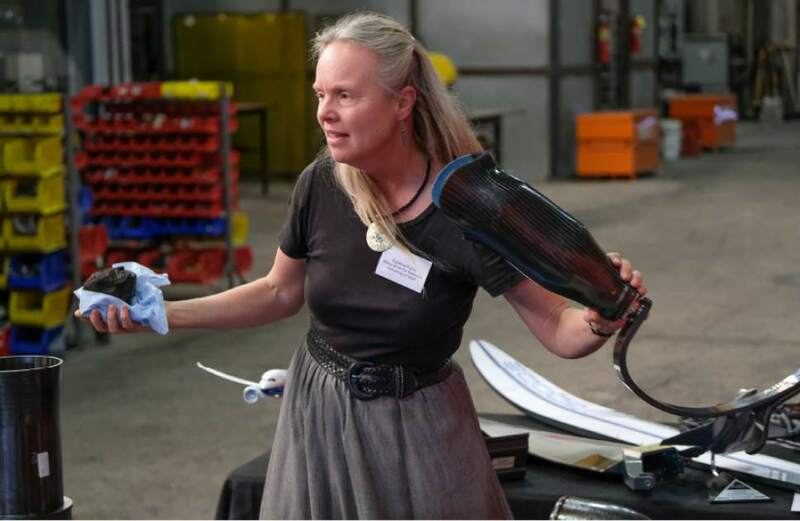 Carbon fiber is used to produce materials that are low in weight and thermal expansion and are high in tensile strength, stiffness, and chemical resistance  properties well-suited for prosthetic limbs, skis, aircraft and satellites. Using coal for carbon fiber could open new possibilities for Utah coal. But many technical hurdles would need to be overcome, according to Eddings, who is leading the U. research in partnership with the University of Kentucky. The first step is to heat the coal in the absence of oxygen to break down its molecular structure, then gather the fragments into "pitch," an asphalt-like substance than can be melted and spun into carbon fiber. U. researchers plan to handle the front end of this process, exploring ways to convert Utah coal into pitch, while Kentucky colleagues will take this material and determine how it can be processed into fibers. Carbon fiber is now typically produced from polyacrylonitrile, or PAN, which is produced from petroleum. Eddings hopes to find a way to make coal pitch in ways that cost less and emit less carbon dioxide. "What can we do differently using our knowledge as combustion people, as chemical engineers" Eddings asked hypothetically, "to modify those processes so we produce things that lend themselves better to carbon-fiber properties, or provide a greater yield?" With assistance from Utah composites manufacturers, the project will examine market potential for carbon-fiber composites produced from Utah coal. 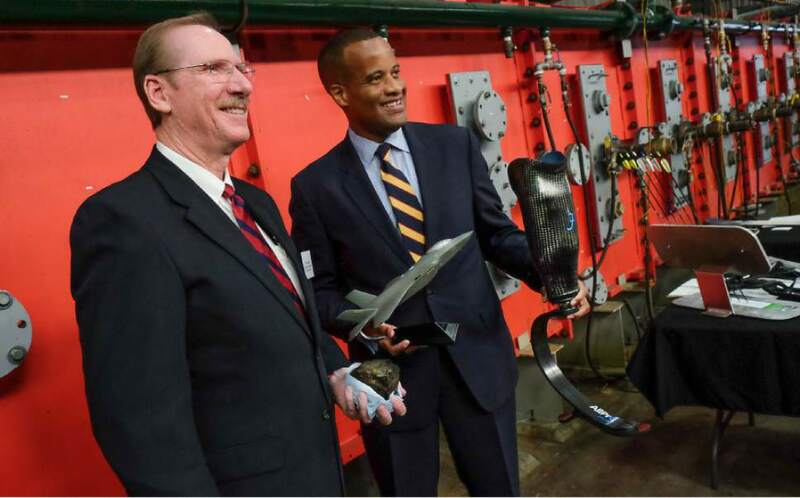 The state is a hotbed for advanced composites, with 30 companies manufacturing items that include carbon fiber and that employ more than 12,000 workers. "The question is, Can Utah coal have some innate benefit that lends itself to carbon fiber that is somehow better than other coals?" said Greg Jones, founding director of Utah Advanced Materials and Manufacturing Initiative, a consortium of materials companies, research centers and state agencies. "Can we find a way to produce carbon fibers more economically so it can be competitive and the market can grow?"